The UK dates for OMD’s forthcoming English Electric tour will see support by JOHN FOXX & THE MATHS. John Foxx has been a presence on the UK electronic music scene for many years and was the original vocalist for Ultravox before leaving to pursue a solo music career (during which Midge Ure joined Ultravox). Foxx’s solo career post-Ultravox is most notable for the single ‘Underpass’ which reached No. 31 in the UK charts and has become a classic of the early UK synthpop scene. Foxx’s album Metamatic has likewise been established as one of the most prominent electronic music albums of its time. John Foxx & The Maths came about as a collaboration between Foxx and producer and musician Benge. The album Interplay arrived in March 2011 which was described by The Quiteus as “one of the finest electronic records you’ll hear in 2011.” Their third album release Evidence features collaborations with The Soft Moon, Gazelle Twin, Xeno & Oaklander and Tara Busch and also includes a cover version of Pink Floyd’s ‘Have A Cigar’. Evidence will be released by Metamatic Records on 25th February. 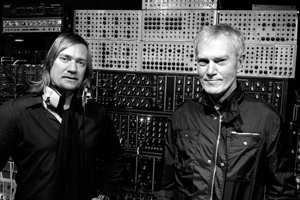 There’s another OMD angle here as John Foxx & The Maths has worked alongside Hannah Peel who is perhaps best known for her unique musicbox cover version of OMD’s ‘Electricity’ as featured on her debut EP Re-Box released in 2010.